EA is resurrecting NFL Blitz just in time for the end of the NFL season, and it looks like a return to the series' arcade roots. The series, which has lain dormant since 2005's Midway-developed Blitz: The League, is now owned by EA and given its recent success with the excellent NBA Jam: On Fire Edition, the company is likewise hoping to revive NFL Blitz. The new NFL Blitz looks to return the franchise to its arcade roots, and from what we've seen based on our hands-on time, it looks like this was an easy score for EA. Aside from 30-yard first downs and 2-minute quarters, you'll see post-play elbow drops, players launching themselves across the field like missiles to make unbelievable tackles, and guys just getting the ever-loving stuffing beaten out of them without a single yellow penalty flag in sight. As with the new NBA Jam titles, the upcoming Blitz allows you to earn currency by playing the game that can be used to unlock cheats, hidden players and other extras. So far the game lacks any sort of official release date, but the company claims it will appear in January 2012. Officially, the number of platforms on which it might appear has yet to be revealed, but I feel safe in assuming the PlayStation 3 and Xbox 360 will be among the final tally. As much as I'm giddy for this revelation -- seriously, I loved the new NBA Jam -- I have a few concerns. First, is this game going to immediately date itself with a stab at relevance via whatever meme is popular at that moment? The honey badger team was lame. Period. 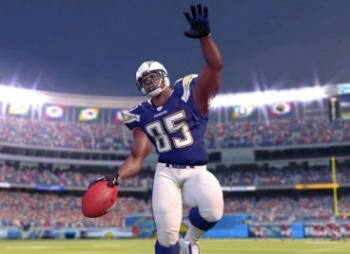 Second, while I'm happy to see the Blitz license again tied to real NFL teams, does this mean the new game will completely lack Lawrence Taylor? I'd pay good money to see LT decapitate one (or both) of the Manning brothers. Oh, and while I'm on the subject, and EA is so eager to revive old arcade-style sports games, can I again wonder aloud where my new Mutant League Hockey is? Anyone? Anyone? Bueller?